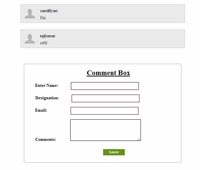 Hi ,I am going to explain about how to create simple comment box system using php. The comment system one of the important thing for blog or website because the user comments is publicly visible to all. Each and every customers know about others comments about the particular post or pages. Most of the members using this comment box system for blog post. Another important thing is to validate the particular form fields to avoid unformulated data from the customer. The below images shows how the comment box looks like.